South Korean electronics giant Samsung Electronics said Thursday it will release smart televisions equipped with its new platform built around the Tizen operating system this year, as it seeks to lower its reliance on Google. Samsung said all of its new web-connected TV sets would be run by Tizen, and added that it would unveil its first-ever Tizen smart TVs at a consumer electronics fair in Las Vegas next week. "Building our Smart Platform around Tizen is a groundbreaking step towards a much more intelligent and integrated system," Lee Won-Jin, a Samsung executive vice president, said in a statement. "Tizen not only enriches the entertainment experience for our customers today, but unlocks great potential for the future in home entertainment," he said. Samsung, the world's largest mobile phone producer, has focused on developing the Tizen operating system along with companies led by Intel to lower its reliance on Google's Android operating system. 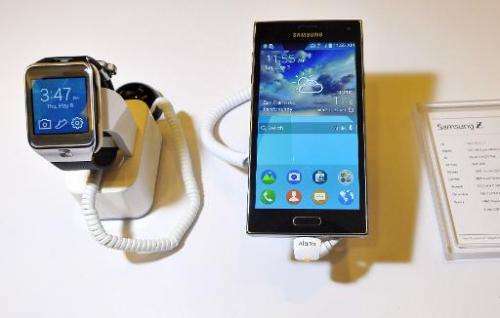 Tizen can be applied to mobile devices, digital cameras and home appliances. Samsung has rolled out Tizen-based digital cameras and wearable smart watches this year.